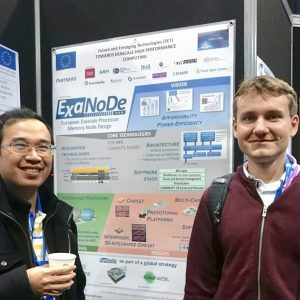 On Tuesday 23rd January, the partners of the ExaNoDe, ExaNeSt, ECOSCALE and EuroEXA projects gathered at the HiPEAC conference in Manchester, UK, for the joint Exascale workshop. Programming Environment, Applications and Evaluation. The workshop concluded with a presentation of the vision and objectives of the EuroEXA project, which started in September 2017.